"There are few people in this town that will ever have the impact on the industry that Brent had - and continues to have." It is with great sadness that we report the death of former FTAC Chairman Brent Swift, who died on April 18th in North Hollywood, California after a brief battle with liver cancer. He was 60 years old. Brent was born in San Mateo in northern California, and was educated at the University of Washington. He was a production designer with credits on a number of independent feature films and many TV movies and TV series. 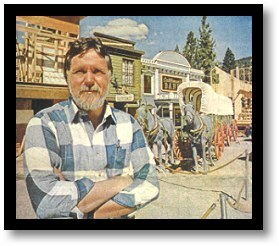 His introduction to the film industry was working with production designer Leon Ericksen on the 1973 film Cinderella Liberty. His TV credits included Soldier of Fortune, Alien Nation, Weird Science, and Bonanza: The Next Generation. He was nominated for a Cable Ace award for the HBO special Billy Crystal’s Midnight Train to Moscow. He served as treasurer of the Art Directors Guild in the late 1990’s, during which time he was active in Guild politics and helped gain computer training for the membership. A dedicated political activist, in recent years Brent had become well known as the chairman of the Film and Television Action Committee. FTAC formed in April 1999 when a group of concerned film and television industry professionals coalesced around the problem of outsourced or “runaway” production. Brent was instrumental in the planning of our first events to raise public awareness. After rallies in Burbank that spring, in July thousands of FTAC supporters and hundreds of Teamster vehicles staged a protest around the Capitol in Sacramento, followed a month later by the largest labor rally in the history of Hollywood when an estimated 15,000 people marched down Hollywood Boulevard. Governor Gray Davis rewarded these early efforts with the creation of popular Film California First Fund. Initially FTAC’s treasurer, Brent was elected our chairman in the spring of 2000. Under his leadership FTAC moved from focusing on the state of California to the entire country. Brent campaigned relentlessly to raise funds and political support to fight runaway production, regularly meeting and corresponding with labor leaders and politicians as well as chairing FTAC’s regular public meetings. In addition to willingly and knowledgeably discussing the issue with anyone who wanted information, Brent was frequently our primary spokesperson. He was interviewed on CNN's "Lou Dobbs Tonight," many radio and TV news shows, and was quoted in newspapers around the United States and even overseas. FTAC’s Executive Directors Tim McHugh, Don Newman and Gene Warren issued the following statement: "There are few people in this town that will ever have the impact on the industry that Brent had - and continues to have. In an age when studio and union leaders alike were more than happy to look the other way as film industry jobs were shipped out of the country, Brent took a stand. For the past few years, he was not only the heart and soul, but the legs and shoulders of FTAC as well. Even as his health declined, he never gave up. We will miss him greatly. And when we inevitably win this battle for the American workers, we will all owe Brent Swift a debt of gratitude." Brent is survived by his wife and children, as well as the almost half a million American entertainment industry workers on whose behalf he labored passionately. A private memorial gathering is planned for a later date. In lieu of flowers, his family asks that contributions in his memory be made to the Film and Television Action Committee.